A group of migrants wait to cross a border line between Serbia and Croatia, near the village of Berkasovo, about 100 kilometers (62 miles) west of Belgrade, Serbia, Oct. 18, 2015. Germany is offering to support Turkey's faster track into the European Union on condition that Ankara helps alleviate Europe's growing immigration crisis. 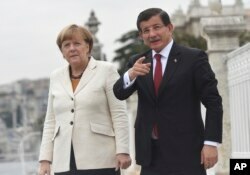 German Chancellor Angela Merkel made the announcement Sunday in Istanbul after talks with Turkish Prime Minister Ahmet Davutoglu. In return, Turkey is expected to sign an agreement to take back migrants returned by the EU. "But of course we also have some expectations in return," Merkel said. "There is an agreement on migrants between Turkey and the European Union and this holds true for third countries as well, but of course visa liberalization and readmission agreements should also go into effect. Another issue is to share the burden." Davutoglu said he would sign the so-called "readmission agreements" only if there is progress on liberalizing the EU visa regime for Turks. Turkish Prime Minister Ahmet Davutoglu, right, talks to Germany's Chancellor Angela Merkel, left, during their meeting on the grounds of his office in Dolmabahce Palace in Istanbul, Oct. 18, 2015. "We are ready to fight against illegal migration, against human traffickers who exploit desperate people," Davutoglu said. "Turkey is ready for all kinds of cooperation with this regard. Immigration is a case but this should be legal and coordinated. Turkey and Germany will work shoulder to shoulder for legal and coordinated migration. And we need to find a solution to the problem in Syria to end the migration problem." But the Turkish prime minister stressed that the burden of immigrants should be shared fairly. Turkey is home to more than 1.7 million refugees from Syria in addition to others from Iraq, Afghanistan, Pakistan and elsewhere. Europe is struggling with the influx of migrants from the Middle East, especially Syria. Many of them leave from Turkey and travel through the Balkans in an attempt to enter the 28-nation bloc. The European Union would offer billions in aid and concessions to Turkey in exchange for measures to stem the mass movement of migrants coming from Syria, Iraq and other war zones into Europe. Officials said the incentives offered to Turkey would involve an aid package of at least $3.4 billion to help Turkey host the more than 2 million refugees that are in the country, as well as easier access to EU visas for Turkish citizens and re-energized EU membership talks. Merkel is due to meet later in the day with Turkey's President Recep Tayyip Erdogan. Erdogan has previously criticized Europe's efforts to deal with the crisis and urged Brussels to take Ankara's EU membership bid more seriously. "They announce they'll take in 30,000 to 40,000 refugees and then they are nominated for the Nobel for that," he said in a jab at Merkel, who had been tipped as a Nobel Peace Prize contender for her welcoming stance to refugees. "We are hosting 2.5 million refugees but nobody cares." Apart from the migrant crisis, the Turkish and German leaders will also discuss the fight against terrorism and the situation in Syria. 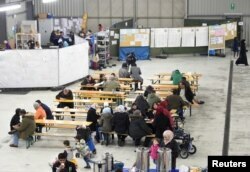 Migrants sit in a canteen in a refugee camp in Celle, Lower-Saxony, Germany, Oct. 15, 2015. Also Sunday, about 40 buses packed with migrants queued to enter Croatia from Serbia, their passage to Western Europe slowed by a new diversion through Slovenia as weather conditions worsen. Many had spent the night on the buses, wrapped in warm clothes and blankets against the autumn cold. They woke to dense fog. 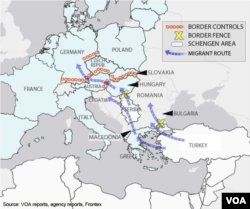 Hungary sealed its southern border with Croatia to migrants at midnight Friday, forcing them west to fellow EU member Slovenia, a small former Yugoslav republic of 2 million people that also borders Austria. About 3,000 entered Slovenia Saturday, en route to Austria and Germany, the favored destination of the vast majority, many of them Syrians fleeing war. But Slovenian authorities said they planned to limit the influx to around 2,500 per day in line with the country's capacity to register and accommodate them. That threatened to create a backlog in Croatia and Serbia which in recent weeks have seen upwards of 5,000 crossing their borders every day. Croatian police said Sunday they blocked dozens of migrants seeking to cross from Serbia, anxious to continue their journey toward Western Europe. Migrants faced off with Croatian police in a corn field at the border between Serbia and Croatia where they have been crossing since mid-September. Tensions rose as the Croatian police deployed along the boundary to stop them. A spokesman for the United Nations refugee agency warned that Hungary's decision to close its border for migrants has increased their suffering and could lead to a backlog down the route. Babar Baloch, regional spokesman for Central Europe for the U.N. High Commissioner for Refugees, said the new migrant route through Slovenia has significantly prolonged their already weeks-long journey toward Western Europe. Baloch warned "there will be challenges if the process becomes slow or we have a backlog of people." Austrian police say that about 1,000 refugees and other migrants were registered on Saturday and overnight as they arrived at one of the country's main border crossings with Slovenia. Men carry their children wrapped in emergency blankets shortly after arriving with other migrants and refugees on the Greek island of Lesbos after crossing the Aegean sea from Turkey, Oct. 18, 2015. More than 630,000 people fleeing war and misery in the Middle East and Africa have landed on Europe's shores this year, many making risky sea crossings from Turkey to Greece. 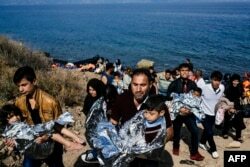 Meanwhile, the Greek coast guard on Sunday said five more migrants including a baby and two boys had died trying to cross the Aegean Sea from neighboring Turkey. Most of the deaths occurred near the island of Kastellorizo, where an American-flagged sailing boat said it had rescued nearly a dozen people, with a dead infant among them. And on Saturday, another 12 people drowned off the Turkish coast, Anatolia news agency reported. The UN refugee agency UNHCR has reported an increase in the number of migrant boats arriving from Turkey this week. "The surge in arrivals could be the result of a temporary improvement in the weather, a rush to beat the onset of winter, and a fear that European borders may soon close," UNHCR said Friday. Dorian Jones contributed to this report from Istanbul. Some material for this report came from AFP, AP and Reuters.